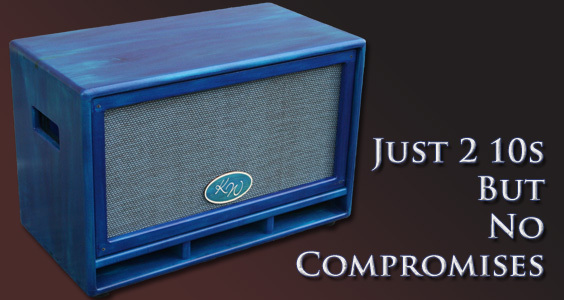 This lightweight ported 2x10 sets the new standard for a small rig with BIG Bass Tone! Wonderful even response with a great vintage tone flare. Weighing in at approx. 35lbs (in Poplar), the SB-210 is designed perfectly to work with two Faital Pro brand 10" Neodymium speakers handling a total of 600 watts. This terrific combination has great response all the way up to 8khz without the aid of a horn or tweeter. A tone that's warm, clear, and crisp, this lightweight 2x10 is more than enough to handle almost any gig, and bring the most out of your bass and amp rig. The standard model is crafted from highly versatile and lightweight Poplar. Custom variations are available in all the great hardwood varieties available throughout the rest of the KW line. Let us help to create your signature tone!